Join area alums for a one-hour fun and fact-filled guided tour that highlights the past, present, and future of the Hidden River. 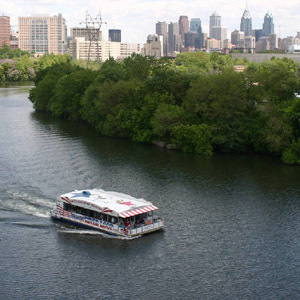 Come aboard the “RiverLoop” and discover the sights and sounds of Philadelphia history as it emerged along the banks of this historic river, dating back to the early 1700s and the establishment of Bartram’s Garden, on to the 1800s and the construction of Fairmount Water Works, and on to the present with its award-winning 21st century skyscrapers marking the Philadelphia skyline. 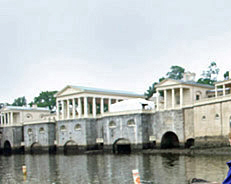 The tour offers a setting and experience unlike any other in Philadelphia. We will hold a brief Club meeting dockside at the conclusion of the tour. The RiverLoop is a U.S. Coast Guard approved vessel with indoor and outdoor seating, and a bar. Non-alcoholic and bar beverages are for sale during all tours. Tours are not recommended for children under age 4. No carry-on food or beverages are allowed. Tours are subject to cancellation without notice in case of inclement weather or conditions that are deemed unsuitable for navigation by the U.S. Coast Guard.